If your business is operating on an annual rhythm or if your plans will take 12 months or less, use the free year timeline for planning or outlining your objectives and sharing them with others. Having a plan is critical before embarking on any business venture. Equally important is the ability to share that plan by presenting it to other stakeholders whether to gain buy-in, to demonstrate your intentions or to update others about the progress that has been made. Writing your plan in a document makes sense, but it can become challenging to share those plans in a way that they are quickly read and understood. Illustrating your 1-year plan in a PowerPoint slide will make the plan easy for you and others to understand, track and follow. Many business initiatives and plans are created over a 12 month term. Efforts such as campaigns, events, marketing initiatives, programs and personal or business projects are often planned to a one year cycle. The twelve month template for planning is suitable for any business or personal project of one year or less. 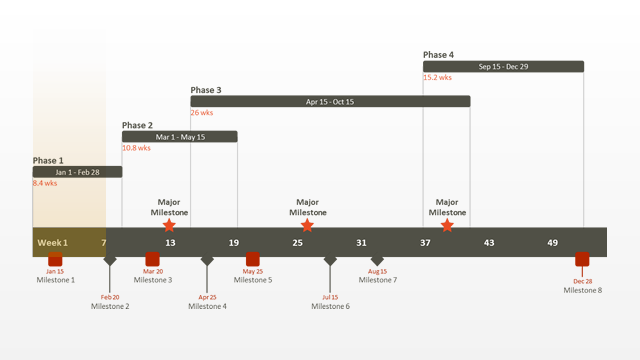 It was designed to present 1 year plans in a familiar graphical way. It was also made as a native PowerPoint slide so you can manually edit the free year timeline template in PowerPoint and share it with any other PowerPoint users. This means teams can collaborate in PowerPoint on a 1-year plan. It also means that clients and executives, who are already familiar with PowerPoint, can easily open and review your plan for the next year. 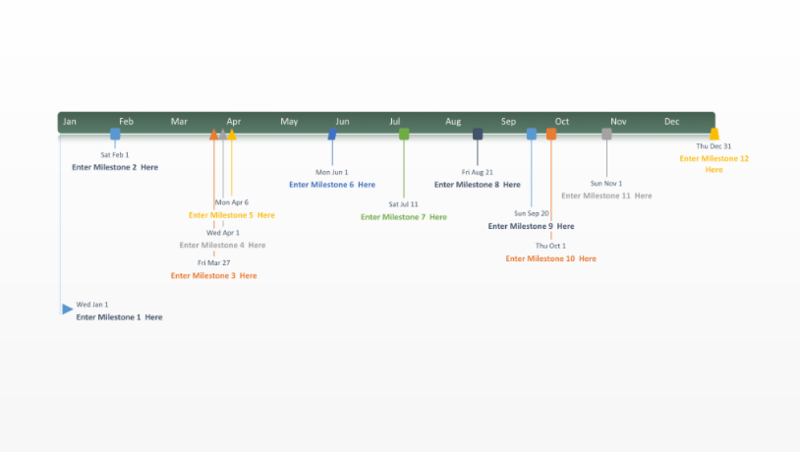 The yearly template was also designed to work seamlessly with the timeline creator from Office Timeline. 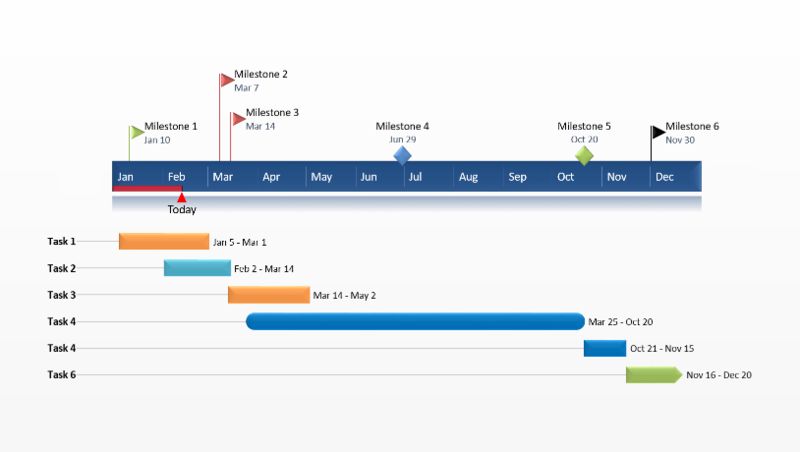 Office Timeline is a free PowerPoint add-in for creating timelines. 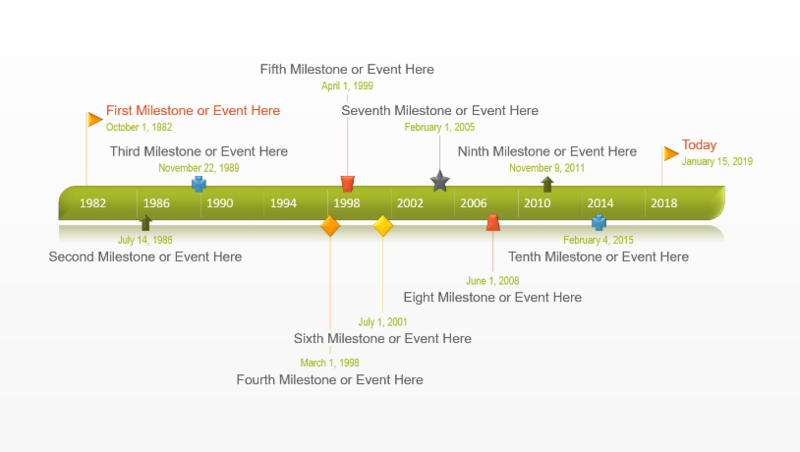 Simply enter the dates and events of your 1 year plan and the timeline creator will update this template instantly, from inside PowerPoint. You can also use it to add to or change data on the 12 month timeline or whenever you need to update it. 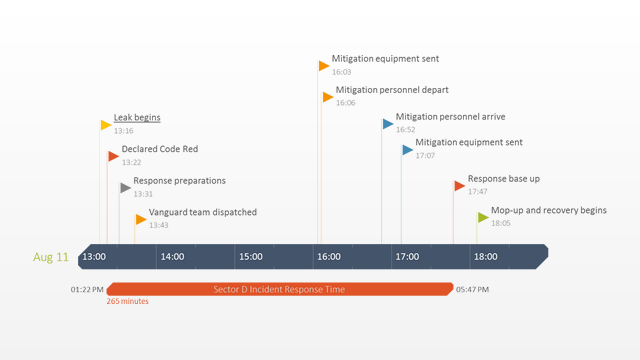 The timeline creator from Office Timeline makes these changes automatically.